Geoffrey Rush/Hector Barbossa appears in this poster for "Pirates of the Caribbean: On Stranger Tides," with that crazy eye glaze that tells you to stay away because he's just a bit wacky. I don't mind Elizabeth and Will missing from these stories, but I'm glad Sparrow's foil and nemesis has not been left out of these new adventures. I can't wait to see one with Ian McShane as Edward Teach. 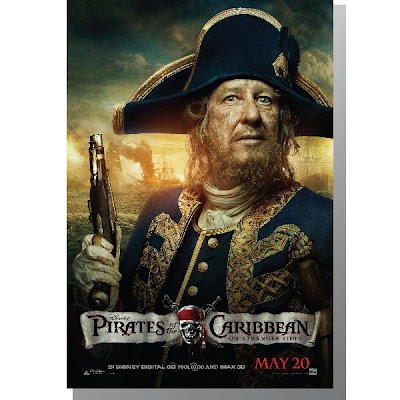 Barbossa has switched sides apparently, and now works for the king of england. Or maybe he's just a double-double crosser? Hector can't be trusted to bow to anyone.